This is one of those healthy kale salad recipes that you’ll always turn to because it’s easy, flavorful and flexible. The base of this salad is fresh chopped kale with a delicious lemon dressing. 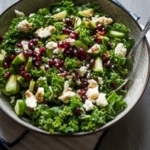 And while pomegranates are still available, this recipe for kale salad becomes seasonal, with a bright pop of fresh pomegranate arils (or pomegranate seeds). That what makes this salad super fresh, fruity with the sweet pop of pom texture. 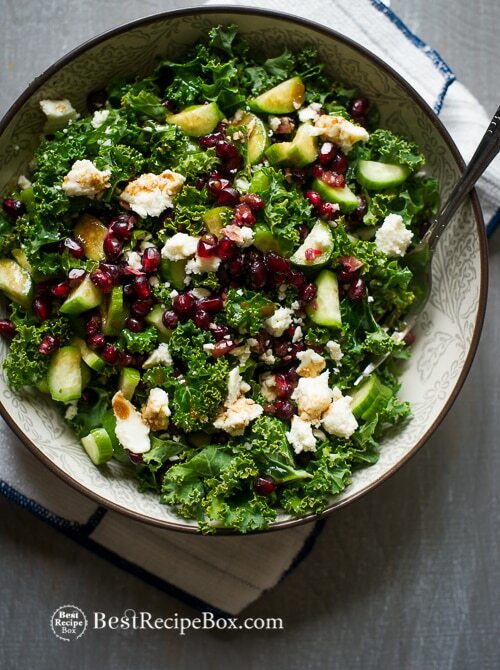 Added to this kale and pomegranate salad are cucumber and feta cheese. But make this salad your own and add what ever you wish. Consider adding some chopped nuts for extra crunch or even some creamy avocado. Or make this salad a main entree by adding some baked chicken or oven baked salmon for a low carb and low fat dinner. What ever you decide to add, this recipe is perfect as a side salad or main dish that’s perfect for any occasion or meal. In medium bowl, whisk together all the salad dressing ingredients. Alternate method: in a mason jar, add all the salad dressing ingredients together and shake well to combine the dressing. Wash kale and blot dry with towels to remove excess water. De-stem the kale leaves and chop the kale leaves into small bite sized pieces. 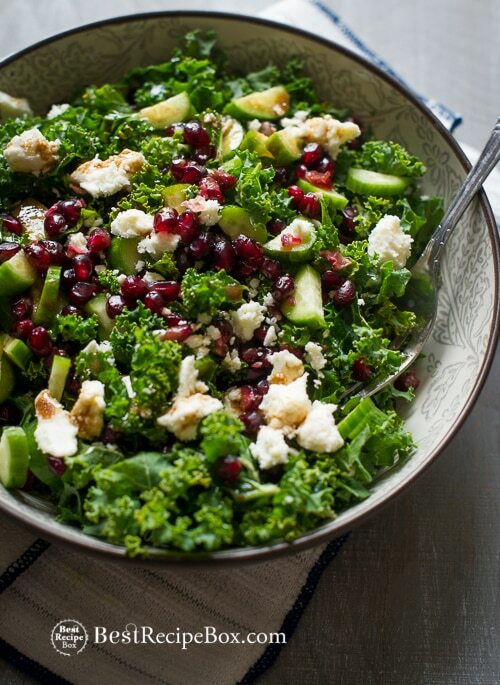 In large bowl, combine the chopped kale, pomegranate seeds, feta cheese and cucumber. Add the salad dressing to the kale salad and toss everything together till all the dressing and salad ingredients are combined. Add additional salt and black pepper to taste. Serve immediately. This recipe look so good and healthy!